Anyway, my radar says there’s fish close by. I freeze in my tracks, get low, and silently survey the rows of colorful shelves while nearby shoppers move nervously towards the exits. I can't pick out the target and kick myself for not having my polarized glasses. But wait. Yes. There. Between the remote control monster trucks and the Wreck-it Ralph action figures. I see it. The Fish Fry. I'm stunned. Random reactions run rampant through my cerebral cortex. That’s SO wrong! Or is it? It does introduce kids to fishing… maybe… but not catch and release. A cut brown, brown ‘bo, rain brown, cutty rain brown? Hank would know. Kid. That trout's only 7 inches! Did you check your local wildlife regs before you fried it? Let me get this straight. A kit to play outdoors, indoors? You can “Camp out in your room” when you turn fourteen, Junior. And then stay there 'till college. “Cookin' at the campsite” Hey! That’s MY shtick! No fire. I'm bummed. Doubly so when I realize that the pass-around flask of Jack isn't included either. We'll fix that at the next stop. Well, my love of the outdoors started indoors with couch cushion shelters built in the living room. The only thing missing was a campfire and of course the fish. Of course it's probably a good thing the fire wasn't included or the dog would have been toast. 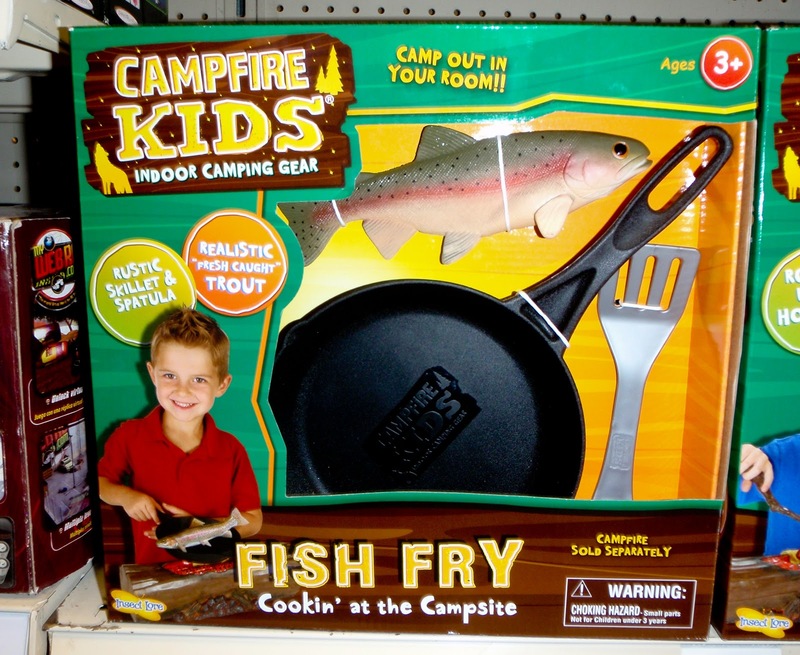 Buy 'em an Easy Bake Oven and run a small Brookie through it. Now that's cookin'! Very strange. You didn't mention a price point, but I imagine it costs nearly as much for this artificial experience ("campfire sold separately") as it would to do the real thing. Thank you for sharing this odd sign of our times. Steve, that sounds disturbingly like the voice of experience. But I really don't want to know. $14.95, Jay. I still haven't quite wrapped my head around it. It seems depressing to me. But like Howard says, sometimes passion for "the real thing" starts with living room play. Glad you chimed in, RM. I was curious what dads with tots thought of this. And my basement looks like a similar construction site when the grandkids arrive. Great fun. That sure looks like one of those "put and take" trout anyway. You put enough back, there's no need to feel guilt over one in the frying pan now and then. Or as my ex-father in law liked to say... first will talk about catching dinner, then we'll talk about catch and release. You're right, Ken. While usually a C&R guy, I've had a fine meal or two sourced by the long rod. There's a time and a place for both. A great point. I hope the fish has entrails. Does it come with a swiss army knife? I'm thinking it's probably like a McNugget or something, Nate. Solid "meat". No fillet knife necessary. All boys, here, Joel, so little experience with Barbies. But can totally relate to the small parts pinch. Lego pieces hurt like a M@#$%F*&^%. It plants the seed in their mind a lot earlier than you would be able to if you took them out! My son has been swinging a broken fly rod around the house way before I would be able to take him out with me. He catches fish every time he goes "fishing"....wish I thought I was that good! I'm glad of that, Darrin. If it does indeed plant the seed then I'm all for it. And if Darrin Jr. is a chip off the old block, he'll have that kind of success. No worries. What, no razor-sharp fillet knife included? Now that would certainly make Christmas morning entertaining.